Expenses Submitted, Approved and Completed will never be deleted when a user account is deleted. 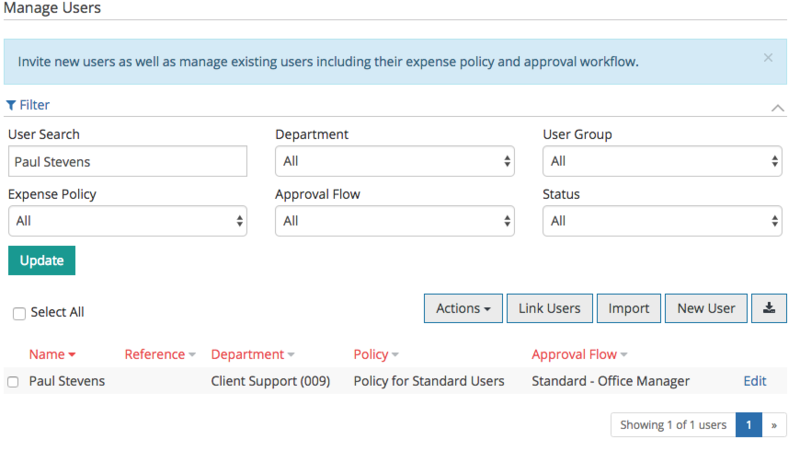 You will need to delete the user from PA Assist and any Approval Flows before deleting the user account. 1. Ensure all outstanding Draft expenses have been Submitted by the user or by an ExpenseIn Finance user. 2. Navigate to the Admin section and click Users. Enter the username in the User Search box. 4. Select the user by clicking the small box in front of their name. 5. Click the Delete button which is now available. 6. Please read the Delete Users confirmation box and click Continue. The user account has been deleted and the expense history for the account is still available in the Finance section.